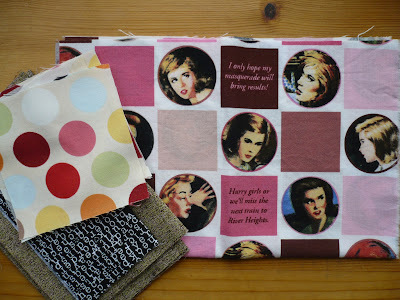 I've Been Baking Again...and a Little Giveaway! 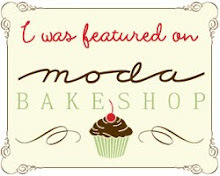 Oh yes, I've been baking over at the Moda Bake Shop again! This is the last of the February pattern-tutorials that I've been keeping under wraps! I'm pleased to introduce you to Summer Dreamin'! The idea for Summer Dreamin' was originally born out of the need for a splash of bright and cheery as the weather got cooler, something to remind oneself of the warmer days of Summer - something that would trigger the knowledge way down deep in your brain that those days will be here again. 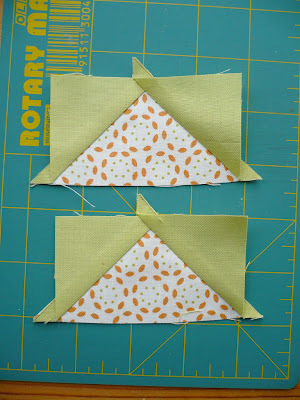 I utilized precuts to create the traditional double-z block and show an interesting way that I came up with to cut and sew the fabric for the half-square triangles - I hope you all find it useful! I used Dream On by Urban Chiks and the quilt finishes at 64x80". 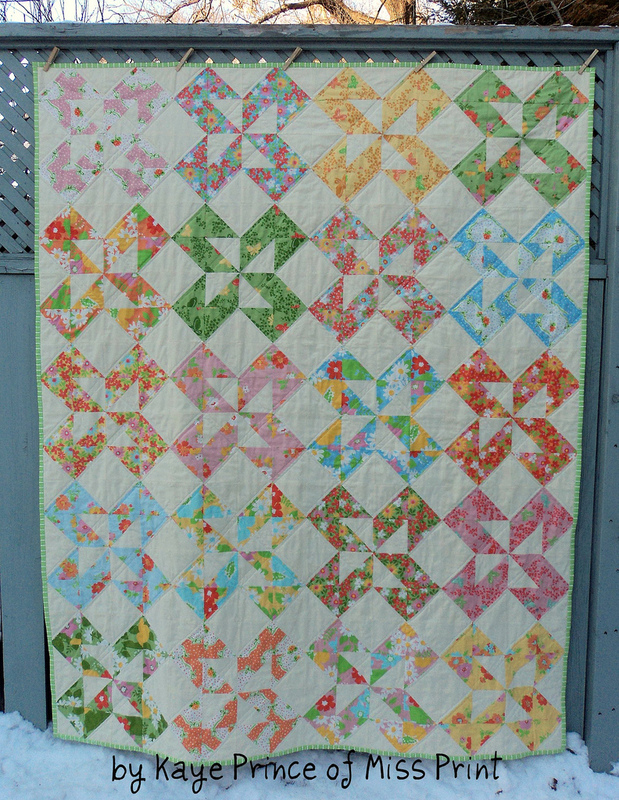 I just love the colours in this quilt and think that Dream On is just so neat in the way that it utilizes vintage sheet design and colouring. 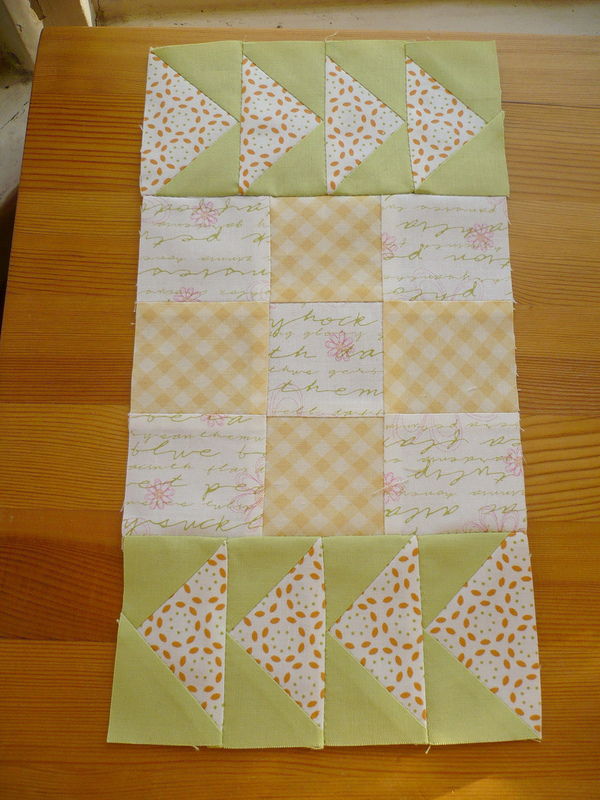 I decided to send the finished quilt to live with my grandparents and I really hope that they'll love it! all listed in the righthand sidebar). I will leave the giveaway open for one week and will announce the winner next Wednesday (March 2nd) - don't forget that you need to leave two separate comments for each entry! This picture was taken by my lovely friend Jennifer while we were in Minneapolis attending Quilt Market this past May - doesn't this stack of Heather Ross' Far Far Away II (which I bought at sample spree) look just dreamy?! 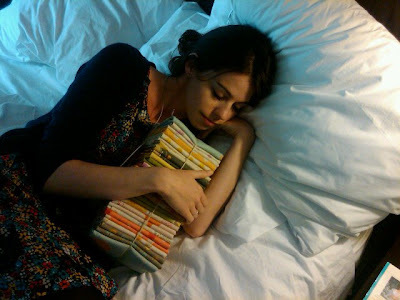 If you look really close you can see the copy of The Blue Castle by my beloved Lucy Maud Montgomery that I gave Jennifer resting on the bedside table. We still have a little doggy here running about so not much sewing has been accomplished, but there has been some knitting! 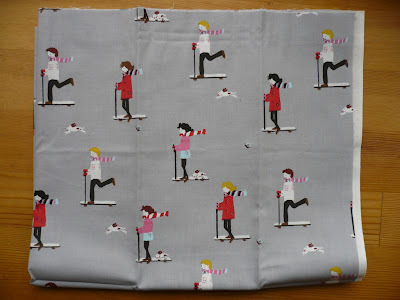 Not only do I take my knitting to classes with me (because I can't do one thing at a time or my mind wanders), but it has proven to be the perfect craft to do during this time when I can't really cut fabric or run a sewing machine without Java getting all curious and up in my business. 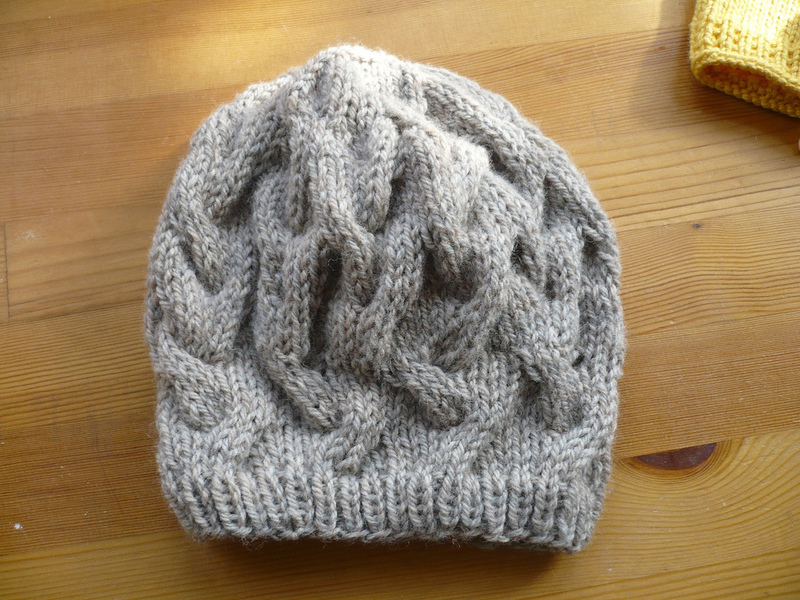 I knit this Star-Crossed Slouchy Beret last week and it was my first cable project (other than just practising with cheap yarn). I still need to get Alex to take a picture of me wearing it so that you can see how the cabled "star" pattern appears at the crown when the beret is slouched on the head. I didn't block this one because I noticed from some other Ravelers completed berets that it slouched quite a bit more than I would like when blocked, and I was already fine with the way it looked on me. 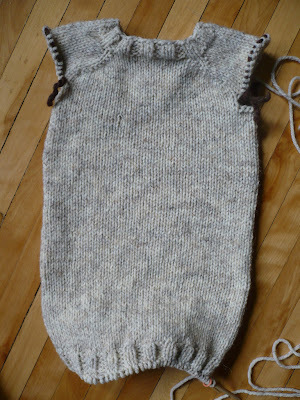 Here's an in-progress shot of the Cascade cardigan that I'm almost done now. 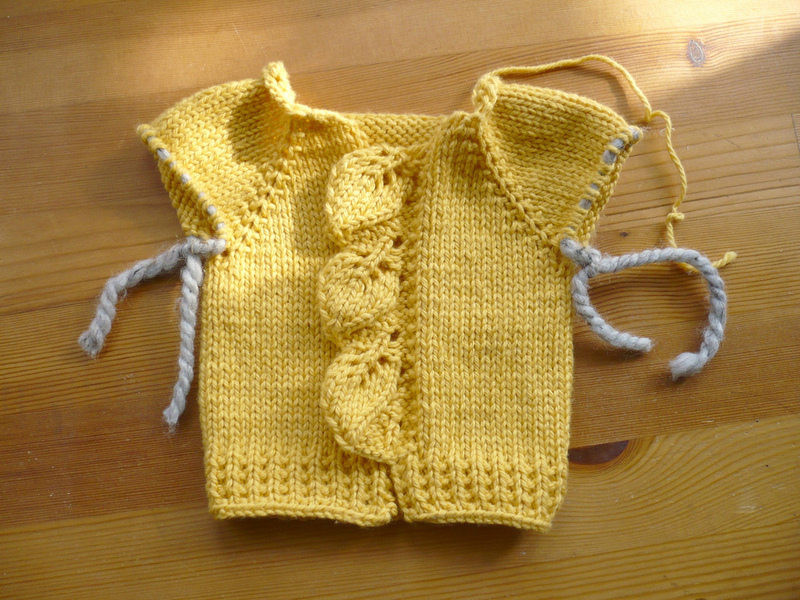 A few of my girlfriends are pregnant right now and this little cardigan is for one of the soon-to-be-babes (can't say which one right now because I know that all the mummys read my blog) - I just love the leaf pattern on the left-hand placket! Since this picture was taken I have finished knitting the right button band and the neck - which follow the same broken rib pattern as the lower band - but was foiled today when I went to buy the correct size DPNs for the arms since today is a holiday in Ontario and the store was closed - boo! 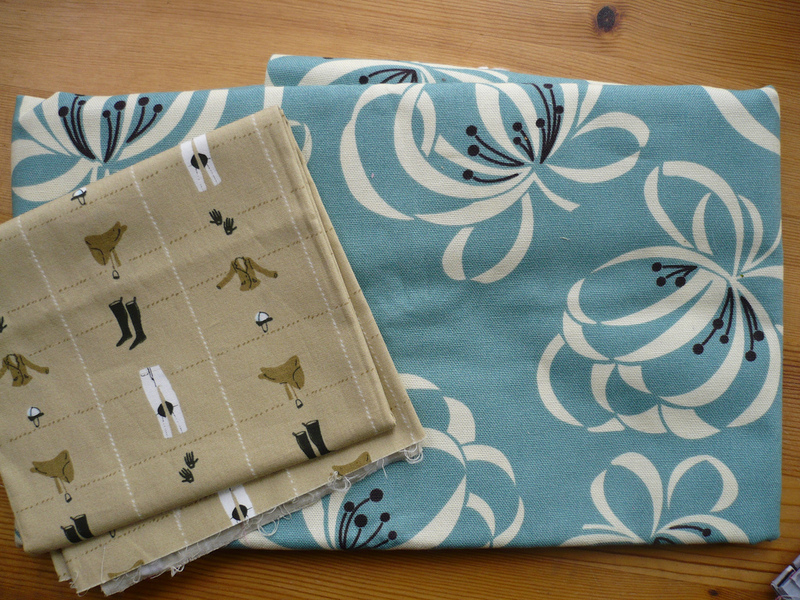 Once I do get the right ones though the sleeves should be done in no time and then it will be off to its new home! 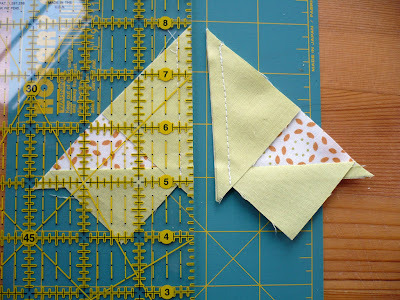 Be sure to come back on Wednesday when I will reveal the last of the patterns for this month and tell you where to find it! 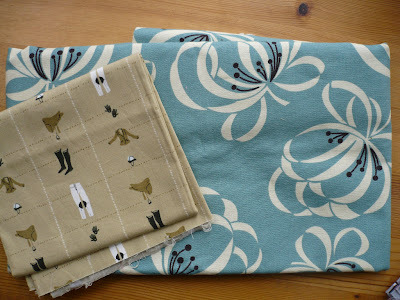 Phew, three patterns/tutorials in one month has just about done me in but I really hope that you guys are enjoying them and have felt inspired to make something yourself. Don't forget that if you've made anything from any of my patterns or tutorials to send me a picture and I'll feature it here on the blog! You guys rock - seriously!!! - I hope you all had a lovely weekend and that your week continues to be full of inspiration, creativity, and love! 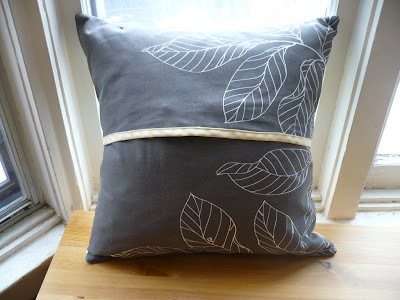 Alrighty folks, I promised you a new pattern-tutorial and today is the day! I was asked to participate in Sew Mama Sew's Pillow Month and concocted this little beauty just for you! 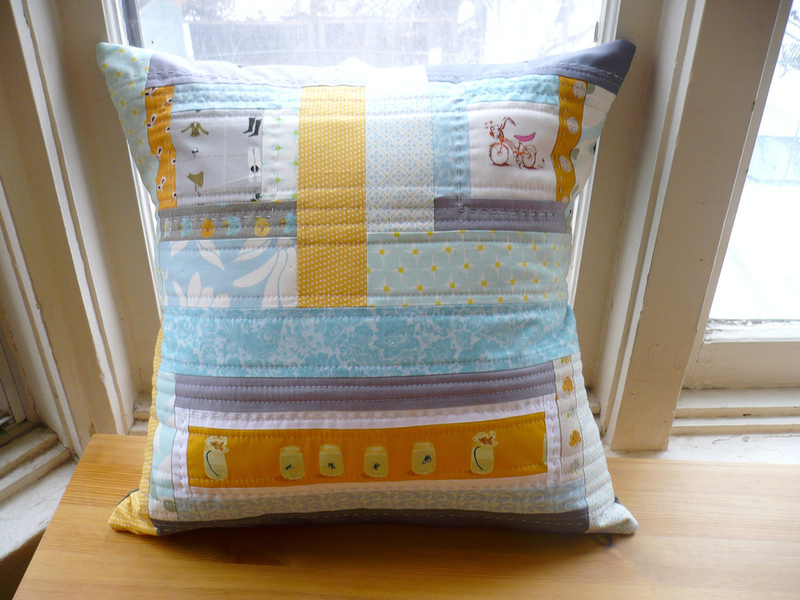 This is my "Not Your Traditional Log Cabin Pillow" pattern which utilizes not only the everyday-square log cabin block and a funky rectangular version, but also both machine and hand quilting. 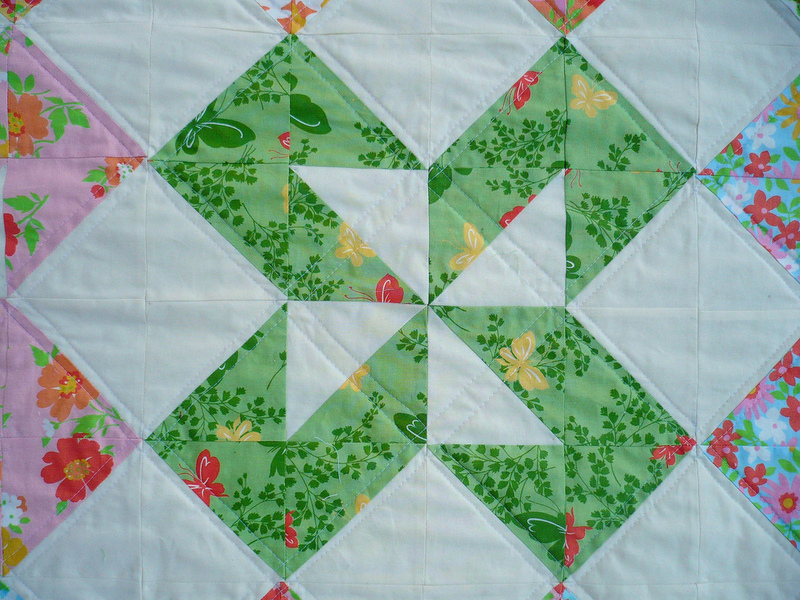 You all know how much I love the log cabin, but you also know that I love to mix it up and get fresh with traditional quilt designs. 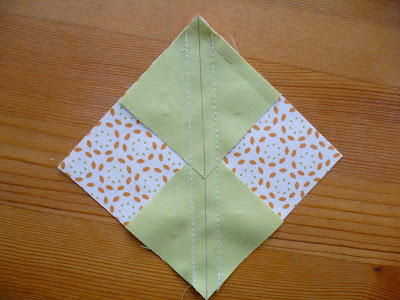 The pattern-tutorial also includes instructions for creating an envelope bock finished off with binding, and some rough hand quilting instructions as well! Hi everyone! Thank you so much for everyone's comments, both here on the blog and in the Flickr group, on my Block-a-Palooza quilt along tutorial! 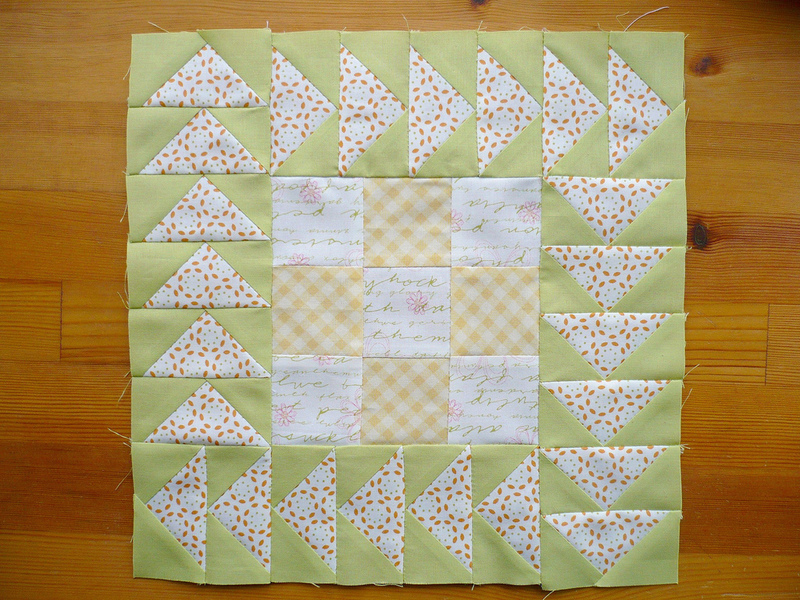 It has been so fun to see everyone's blocks over on Flickr and to see the great array of fabrics that have been used - so very neat! Since I can't show anything that I've been working on right now - which is not much with the dog here let me assure you - how about some pictures of fabric that has made its was into my hands over the past couple of weeks? 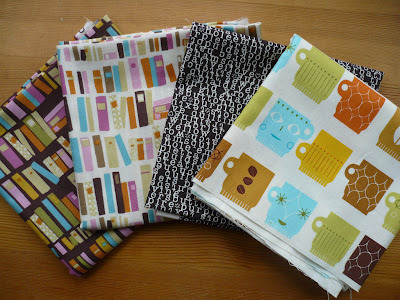 I got a Fabric Shack order this week - woot! I'm using up all of my while Kona in a pattern I'm working on right now, so I figured I should place an order before I ran out completely! 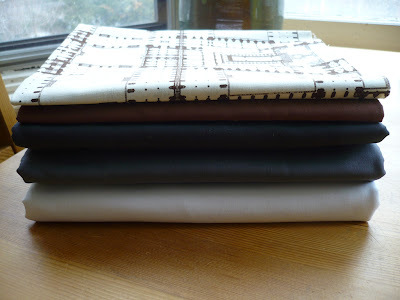 Here we have Kona solids in Mocha, Charcoal, Coal, and White, and a print from Anna Griffin's Flora collection. 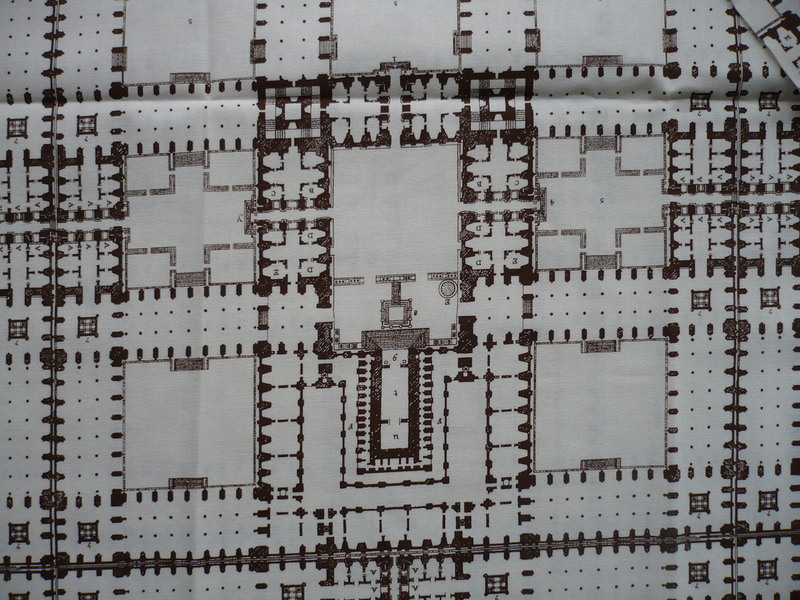 Here's a close-up of the Anna Griffin print; I just had to get it because it reminds me so much of the Baroque architecture plans that I studied in my undergraduate as a Fine Art History major. 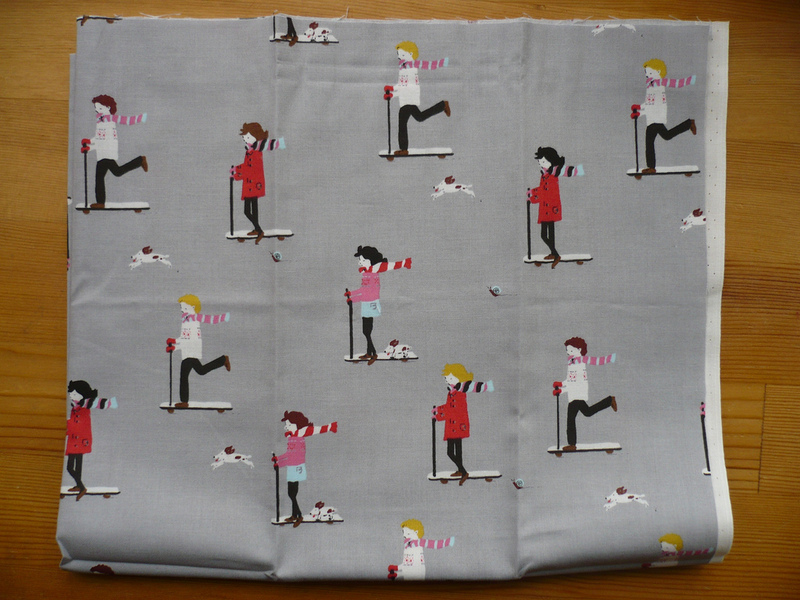 I think this is destined to be the lining for a new bag I want to make. 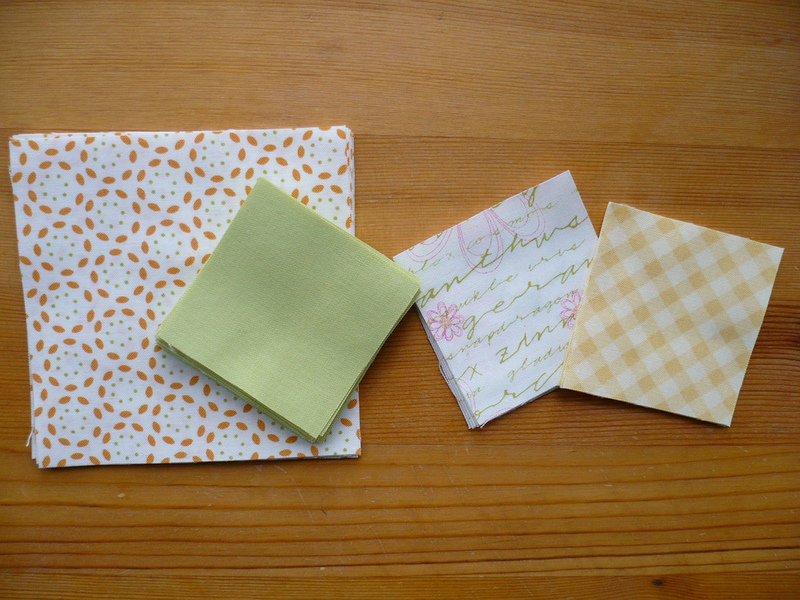 I picked these fat quarters up at The Workroom after the last Toronto Modern Quilt Guild meeting: the two book prints are from the Venice collection, the text print is from Wordplay, and the cute mug print on the end is from I-don't-know-what collection (forgot to check and it doesn't have a printed selvedge). 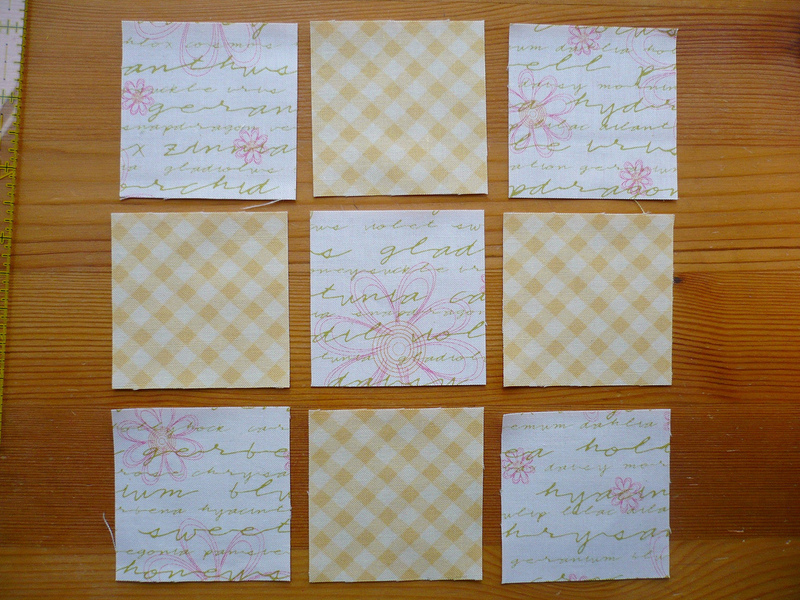 I also picked up some Cosmo embroidery thread for cross-stitch. 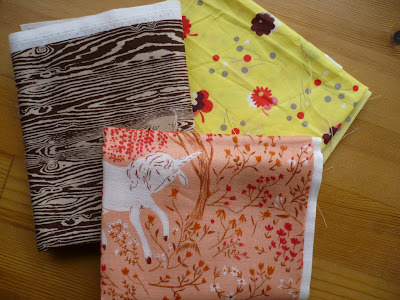 And a 1/2 yard of chocolate woodgrain from Joel Dewberry's Aviary collection, a fat quarter of yellow posies from Denyse Schmidt's Flea Market Fancy, and a fat quarter of pink unicorns from Heather Ross' Far Far Away. Great swap indeed! Heather sent me these scraps when I mentioned that I had been searching for the Nancy Drew fabric - I cannot wait to use them. Thanks so much Heather! Aaaannnndddd... I finished the body of my Oatmeal sweater! This is a picture from before the bottom ribbing was done, but it is done now - woot! I just need to pick up stitches and knit the sleeves and then it'll be done! 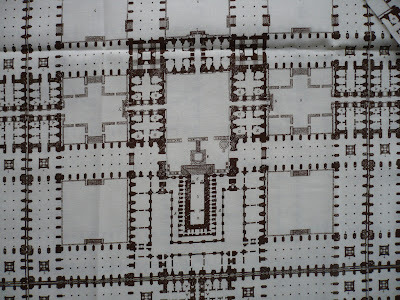 Oh, and don't forget to come back on Tuesday when I will reveal another one of the patterns that I mentioned was coming out this month...phew, I'm tired already! Welcome everyone! I'm so glad that you could join me and really hope that you enjoy making my block for the Block-a-Palooza quilt-along; if you've never been here before why don't you pull up a chair, put your feet up on my table and hang out for awhile? Alright. let's get started! 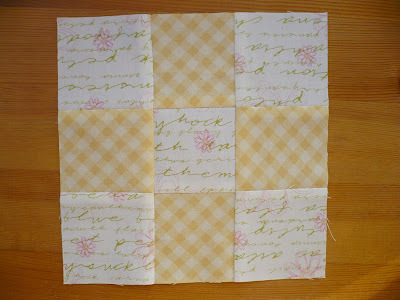 All seams are 1/4" and the block will measure 12.5x12.5" to finish at 12" square. 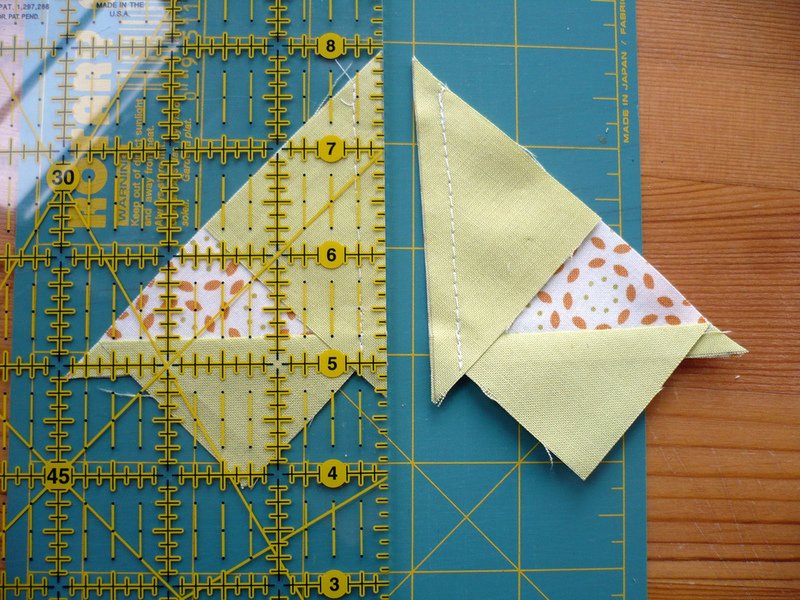 We're going to start with constructing our geese - using the "no-waste" method - so first up: a little prep work! 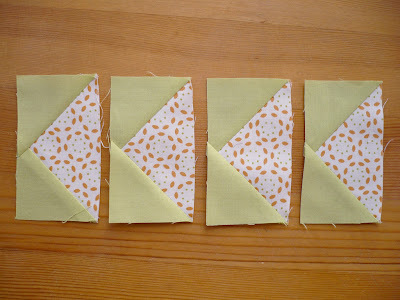 On the wrong side of each of your solid fabric squares draw a line traversing diagonally from point to point. 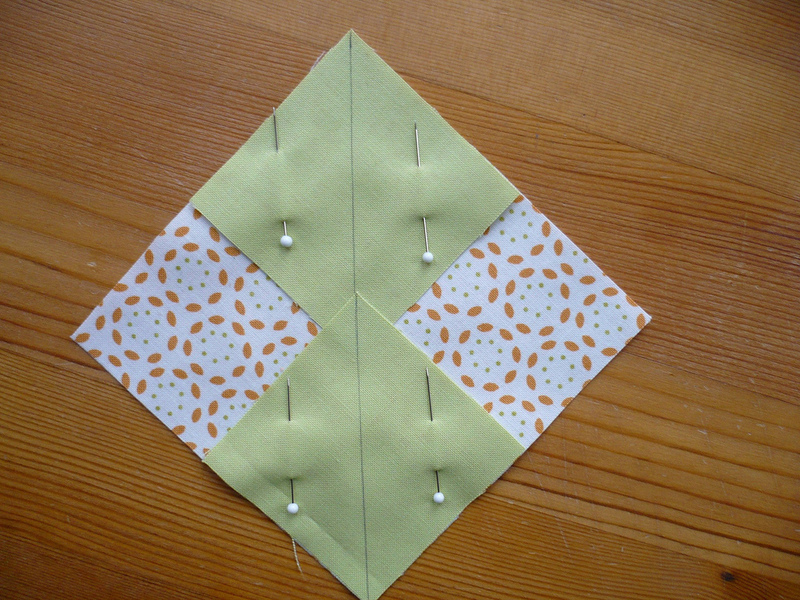 Pin two of your solid squares to one 4.25x4.25" print square, right sides together, as shown in the picture above. The two solid squares should overlap a bit in the centre. 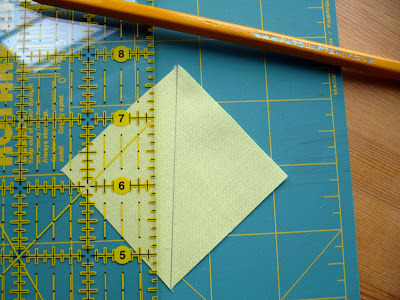 Sew a 1/4" seam on either side of the lines that you drew using them as a guide. 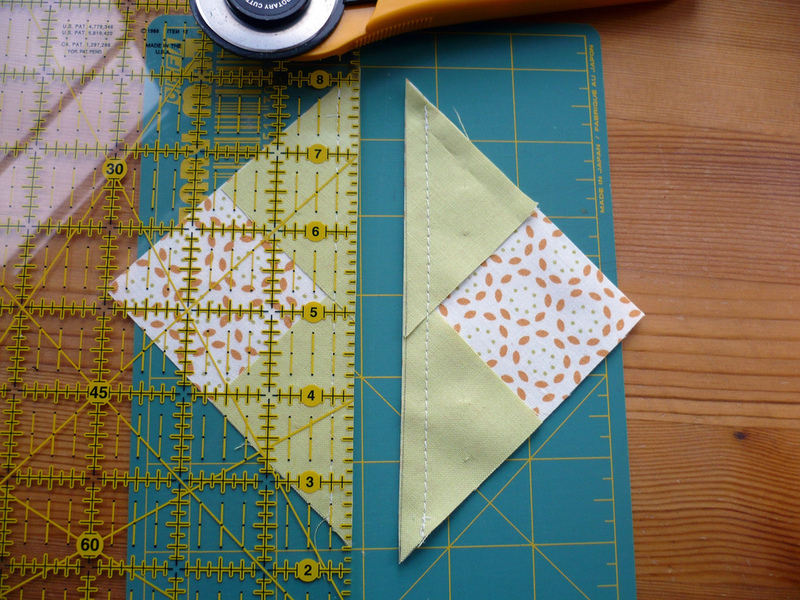 Using your rotary cutter, cut along the line that you drew so that you now have two triangle halves. 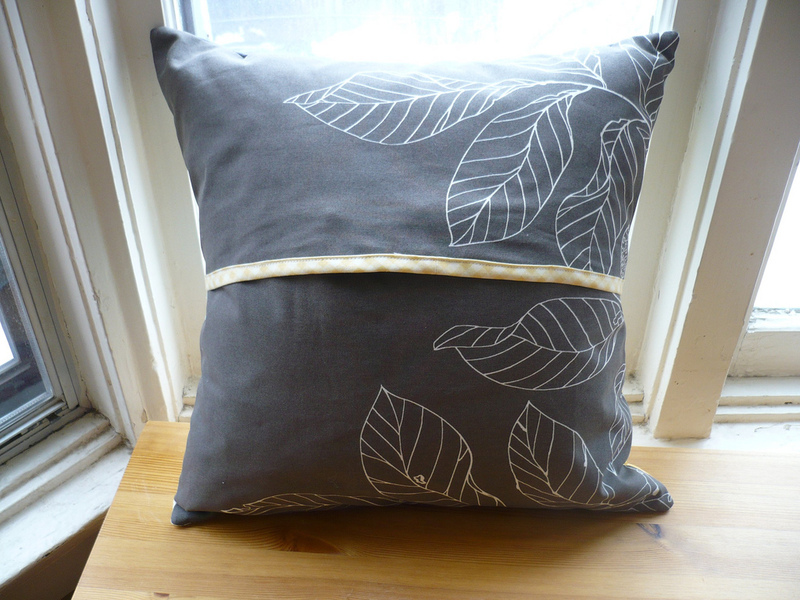 Press your seams towards the solid fabric. 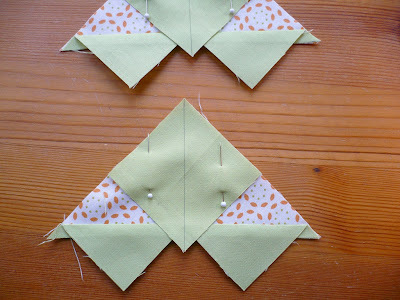 On each of the triangles that you just pressed, pin another solid square so that it is lined up with the top point (flush along the sides of the triangle) and overlaps the solid triangles on the bottom. Once again, sew 1/4" on either side of the line that you drew on the solid fabric. Using your rotary cutter, cut through the line that you drew. 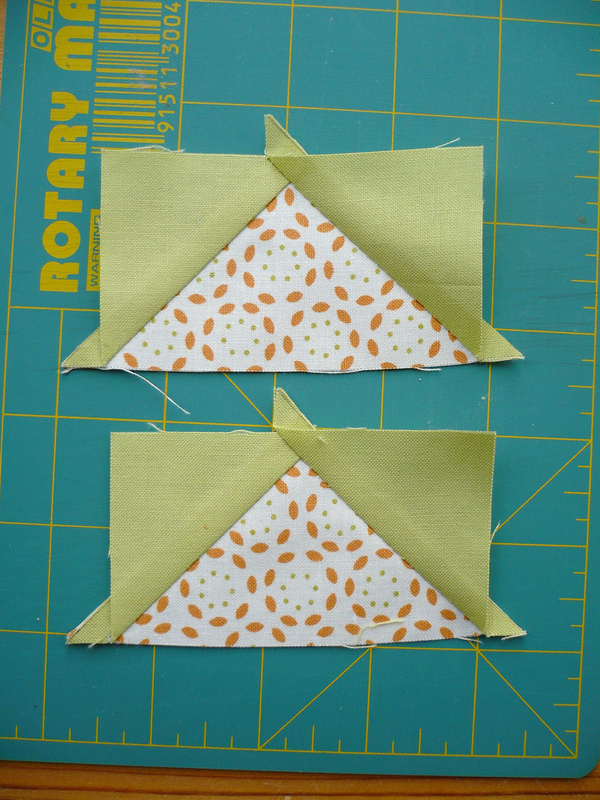 Press your seams towards the solid fabric and trim off the extra little "nubbins" so that you have rectangles. 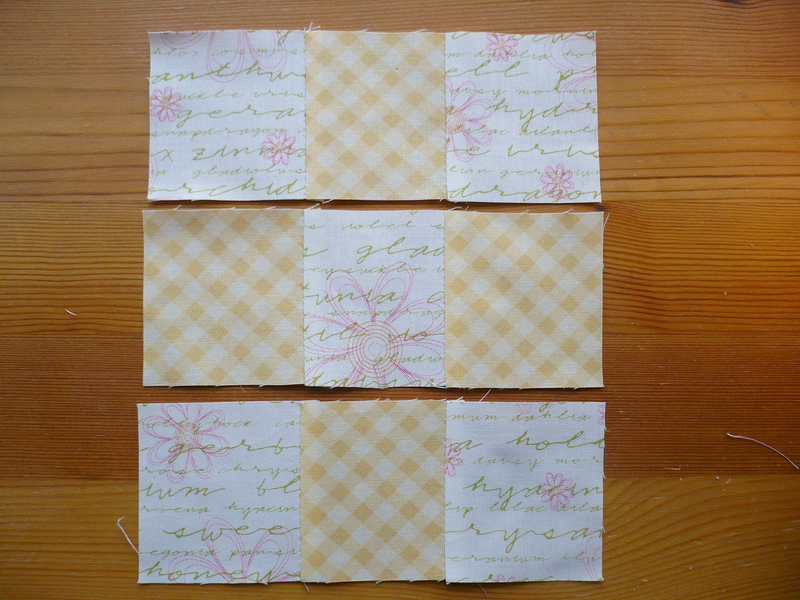 Repeat these steps with your remaining solid squares and 4.25" print squares. 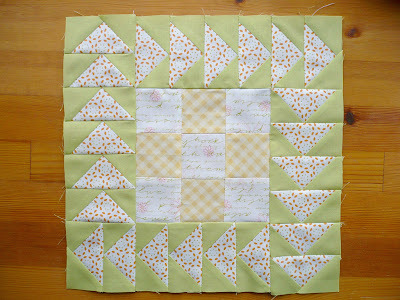 You have now made your geese - give yourself a little pat on the back, woot! 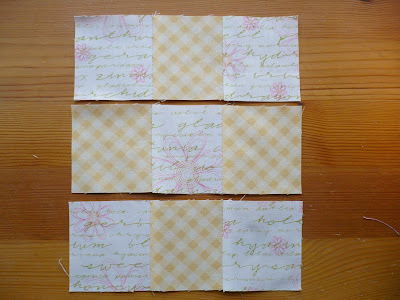 Now it's time to construct out centre ninepatch! 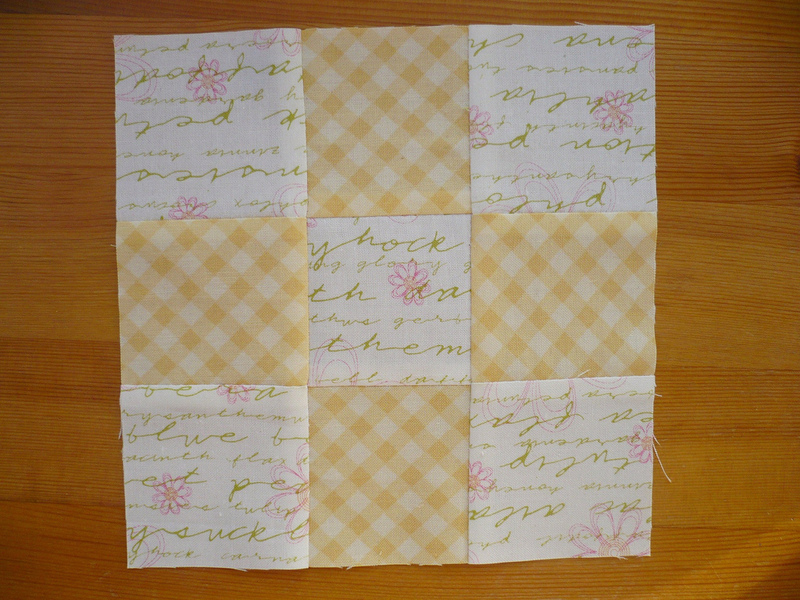 Lay out your ninepatch as shown in the picture above with your five 2.5" square at the corners and centre and your four 2.5" squares filling in the spaces between. Sew your rows together to form the centre ninepatch! 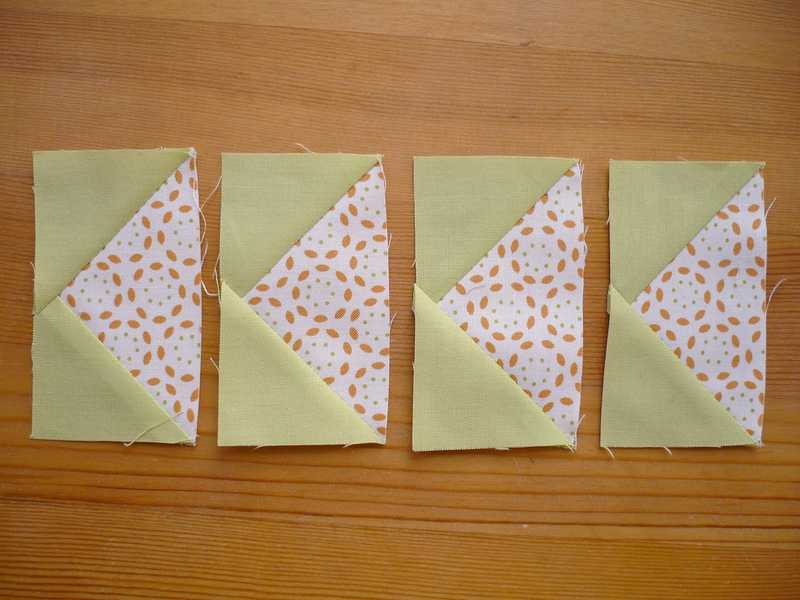 Line up four geese and sew together to form a strip. 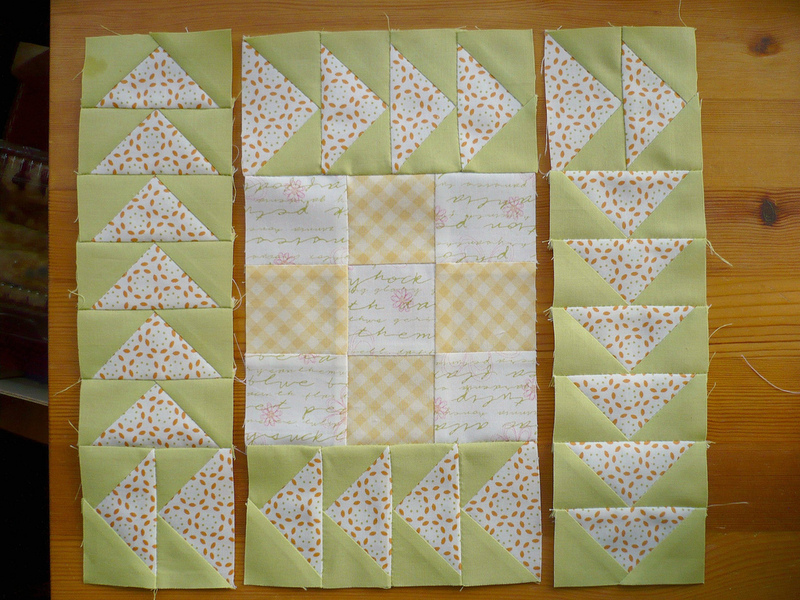 Align your strips at the top and bottom of the ninepatch - the geese at the top should point to the right and the geese at the bottom should point to the left - pin and sew with right sides together. Press seams towards the geese. Sew six geese together to form a strip. Sew two more geese together and than align at the top of your strip so that the long strip is pointing south and the short strip is pointing east - see above photo for visual. 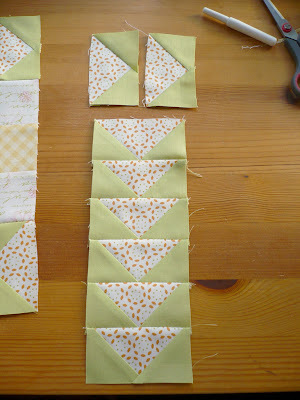 Reverse one of your side border strips so that the two geese are pointing west. 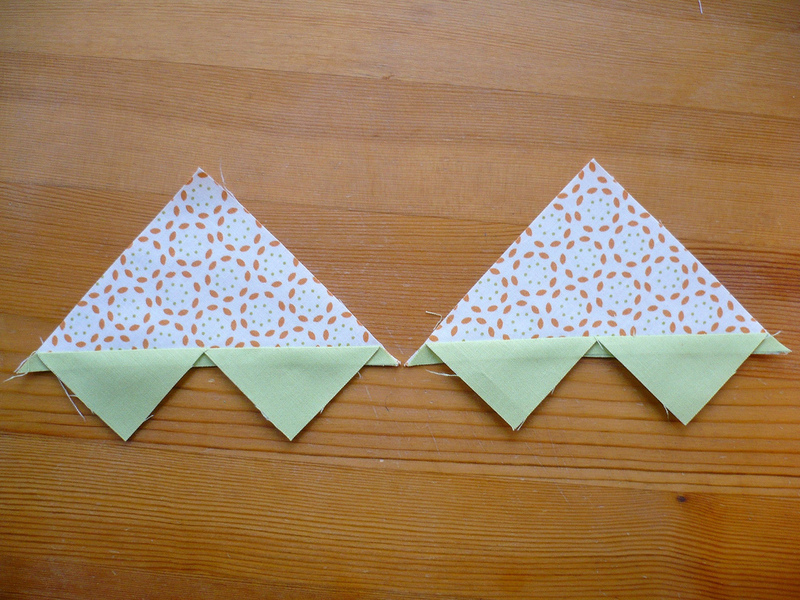 Line up your strips on the left and right-hand sides of your blocks as shown in the picture above and sew with right sides together. Press seams towards the geese. Look at that - you're done! Now wasn't that fun? Now if you'd like the PDF just click here! 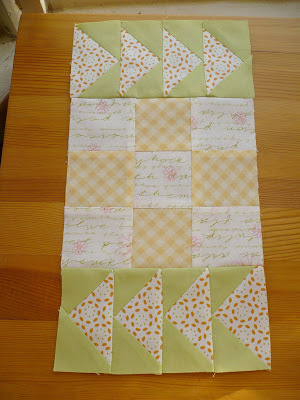 Don't forget that block #6 will be up on Thursday courtesy of Monica of Happy Zombie. Edit: Some people are having trouble printing the PDF directly from Google Docs. If you are having issues, try downloading the PDF to your computer first before printing. 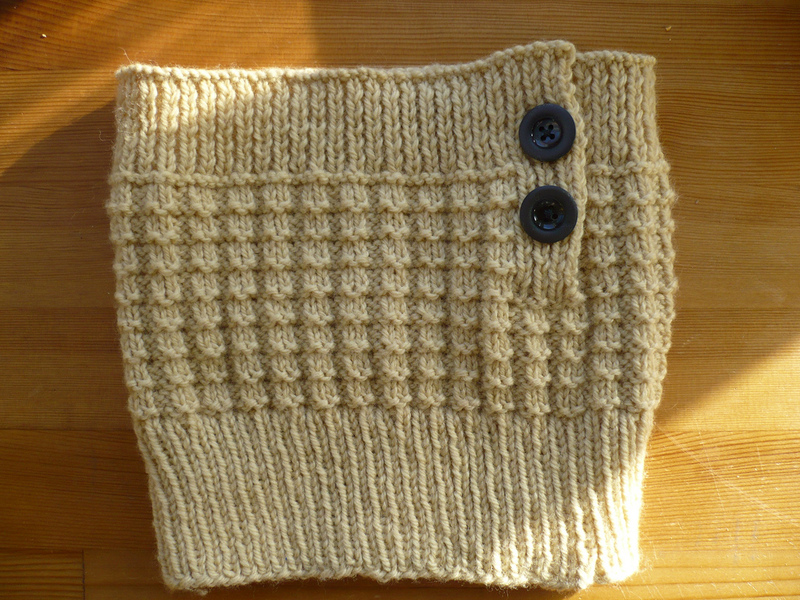 I finished knitting myself a new cowl pattern this past week called Thermis. I used the same yarn as for my "Jane" hat that I showed in my last post for those times when I want to be matchy-matchy! I don't have a picture of it on me right now - gosh, it's ridiculously hard to get a good picture of oneself in the mirror - I may need to enlist the help of Alex again to get a picture! For my next knitting project I've decided to tackle a sweater; I have two patterns that I want to knit - one for a raglan pullover and one for a cardigan - and have the supplies for both, I just need to decide which one won't drive me completely bonkers! Alex and I are looking after his parents dog for a little bit, so let me introduce you to Java! 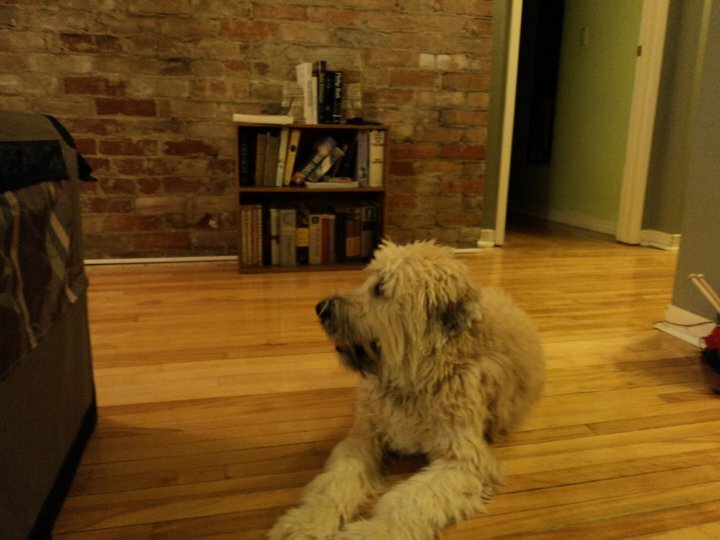 She's a wheaten terrier and less than a year old. She does not like it when Alex leaves the house without her! There's not much quilting or sewing going on here with the dog since I can't use my normal space, but I'm going to try and fit some in while she's here! 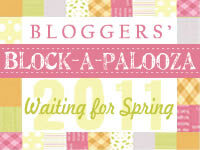 Don't forget that on Monday I will posting my block and tutorial for the Bloggers Block-a-Palooza quilt-along! My block is number 5 so if you have missed any be sure to check out the block schedule I posted earlier!